Voters in Darke County will head to the polls Nov. 6 to select a U.S. senator and a new governor, among other elected offices and issues. Polls will be open from 6:30 a.m. to 7:30 p.m.
Polling places will be open from 6:30 a.m. to 7:30 p.m. Nov. 6. To find your voting location, go online to the Darke County Board of Elections website at https://bit.ly/2CYddVT and enter your street address or call 937-548-1835. DARKE COUNTY — In two weeks, on Nov. 6, Darke County voters will be tasked with choosing from a number of candidates for elected office as well as deciding “yes” or “no” on a variety of state and local issues, although early voting has already begun. For the U.S. Senate, incumbent Sen. Sherrod Brown (Democrat-Cleveland) is being challenged by Jim Renacci (Republican-Wadsworth). Independent write-in candidate Stephen Faris (Fairborn) also is on the ballot. Ohio will select from a large field of candidates for a new governor to replace current Gov. John Kasich, who is finishing his second, four-year term. Current Ohio Attorney General and former U.S. Sen. Mike Dewine (R-Cedarville) is facing off against former Ohio Attorney General and Treasurer Richard Cordray (D-Grove City). Other gubernatorial candidates on the ballot include Travis M. Irvine (Libertarian-Bexley), Green Party’s Constance Gadell-Newton (Columbus) and write-in candidates Rebecca Ayres (Miamisburg), Richard Duncan (Aurora) and Renea Turner (Springfield). In the race for attorney general, attorney Steve Dettelbach (D-Solon) is running against current Ohio Auditor Dave Yost (R-Columbus). For Ohio treasurer, voters will choose between Rob Richardson (D-Cincinnati) and Robert Sprague (R-Findlay). In the Ohio auditor’s race, current Ohio 84th District Rep. Keith Faber is running against former U.S. Rep. Zack Space (D-Celina). Also running is Robert C. Coogan (L-Liberty Township). The contest for Ohio secretary of state has four candidates: Frank LaRose (R-Hudson), Kathleen Clyde (D-Kent), Dustin R. Nanna (L-Delaware) and write-in Michael W. Bradley (Akron). Two Ohio Supreme Court seats are up for grabs in this year’s election. Incumbent Supreme Court Justice Mary DeGenaro (R) faces a challenge from 8th District Appeals Court Judge Mary Stewart (D). Vying for the other seat are Cuyahoga County Common Pleas Court Judge Michael Donnelly (D) and 5th District Appeals Court Judge Craig Baldwin (R). In Ohio’s 8th U.S. Congressional District, voters will choose between incumbent U.S. Rep. Warren Davidson (R-Troy) and Democrat challenger Vanessa Enoch (D-West Chester). The Ohio Senate 5th District contest pits outgoing Ohio 80th Rep. Stephen A. Huffman (R-Tipp City) against Paul Bradley (D-Dayton). Running to replace Huffman for the 80th House seat are Jena Powell (R-Arcanum) and D.J. Byrnes (D-Piqua). In Ohio’s 84th House District race, voters will choose either Joseph Monbeck (D-Wapakoneta) or Susan Manchester (R-Lakeview). Three candidates are hoping to represent Ohio’s 3rd District on the State Board of Education. Incumbent Charlotte McGuire (Centerville) is being challenged for the seat by Dawn E. Wojcik (Trotwood) and Matthew D. McGowan (Liberty Township). 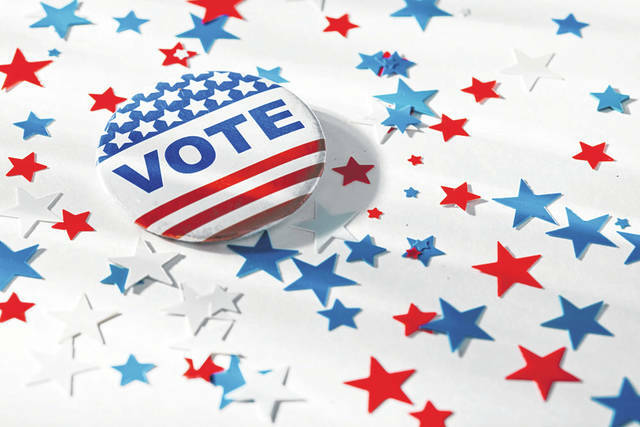 Uncontested candidates on Darke County ballots will include Darke County Commissioner Mike Stegall (R), Darke County Auditor Carol A. Ginn (R) and 2nd District Court of Appeals Judge Jeffrey M. Welbaum (Troy). Statewide, voters will be asked to accept or decline Issue 1, a proposed constitutional amendment that would reduce penalties for crimes of obtaining, possessing and using illegal drugs. GREENVILLE CITY SCHOOL DISTRICT: Tax Levy, Renewal, 2 mills, 5 years, for the purpose of remodeling, renovating and otherwise improving school buildings, furnishing and equipping school buildings and equipping and otherwise improving school sites. MARION LOCAL SCHOOL DISTRICT: Bond Issue and Tax Levy, 8.5 mills, 25 years, for the purpose of new construction, improvements, renovations and additions to school facilities and other improvements including acquiring and installing equipment, furnishings and site improvements, and all necessary appurtenances thereto. MINSTER LOCAL SCHOOL DISTRICT: Tax Levy, Replacement, 0.2 mill, 5 years, for the purpose of recreation. NEWTON LOCAL SCHOOL DISTRICT: Income Tax, 0.75 percent, 3 years, for the purpose of current operating expenses. OSGOOD AREA JOINT AMBULANCE DISTRICT: Tax Levy, Additional, 0.75 mills, Continuing, for the purpose of Ambulance/EMS Services. TOWNSHIP OF ADAMS: Tax Levy, Replacement, 1 mill, Continuing period of time, for the purpose of fire protection and emergency medical services (excluding corporation). TOWNSHIP OF ADAMS: Tax Levy, Replacement, 1 mill, Continuing period of time, for the purpose of fire protection (excluding corporation). TOWNSHIP OF GREENVILLE: Tax Levy, Additional, 1.95 mills, 5 years, for the purpose of ambulance/EMS expenses. TOWNSHIP OF TWIN: Tax Levy, Additional, .5 mill, Continuing period of time, for the purpose of maintaining and operating cemeteries. TOWNSHIP OF WASHINGTON: Tax Levy, Renewal, 1 mill, 5 years, for the purpose of current expenses. VILLAGE OF ANSONIA: Tax Levy, Renewal, 2.6 mills, 5 years, for the purpose of current expenses. VILLAGE OF ARCANUM: Tax Levy, Renewal, 0.5 mill, 5 years, for the purpose of current expenses. VILLAGE OF ARCANUM: Tax Levy, Renewal, 1.6 mills, 5 years, for the purpose of current expenses. VILLAGE OF HOLLANSBURG: Tax Levy, Renewal, 4 mills, 5 years, for the purpose of fire protection. VILLAGE OF HOLLANSBURG: Tax Levy, Renewal, 3 mills, 5 years, for the purpose of police protection. VILLAGE OF PITSBURG: Tax Levy, Renewal, 2 mills, 5 years, for the purpose of general construction, re-construction, replacement and repair of roads. VILLAGE OF PITSBURG: Tax Levy, Renewal, 3 mills, 5 years, for the purpose of general construction, re-construction, replacement and repair of storm drains. VILLAGE OF UNION CITY: Income Tax, Additional, 1/4 percent levy on income, for the purpose of safety service operations. VILLAGE OF VERSAILLES: Referendum, Shall ordinance No. 18-01 be upheld? VILLAGE OF WAYNE LAKES: Tax Levy, Renewal, 7 mills, 5 years, for the purpose of current operating expenses. VILLAGE OF WAYNE LAKES: Tax Levy, Additional, 1 mill, 5 years, for the purpose of current operating expenses. HARRISON EAST AND NEW MADISON: Local Op – Sunday sale of beer, wine and mixed beverages between 10 a.m. and midnight. This entry was tagged election, Elections. Bookmark the permalink.